Recently a question arose of how powerful perspective is as a depth clue, in macro shots of flower parts. To save the discussion from descending into an opinion-fest, I thought it might be helpful to show an example. 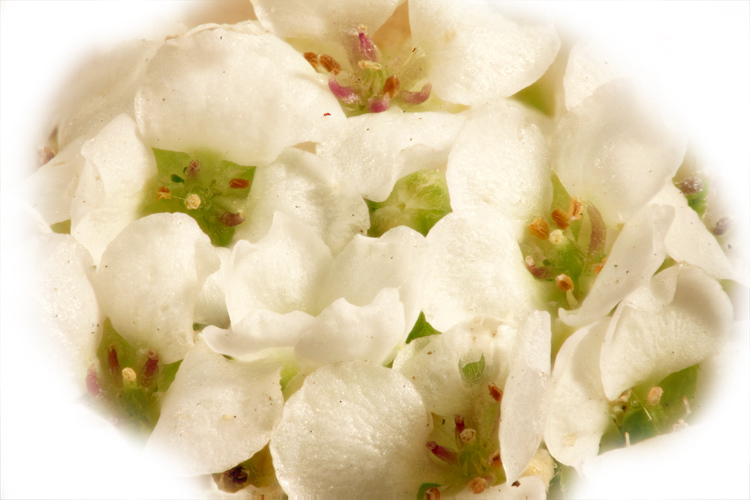 What you'll be seeing here are some small flowers, about 10 mm field width (2.2X on a Canon TI1, sensor size 22.3 mm wide). 1. An Olympus 38 mm bellows macro lens used in its normal manner on minimum bellows extension. This lens provides the most closeup perspective that I can get with the T1i at this magnification. As a result of this closeup perspective, the front in-focus part of this image is over 8% larger (higher magnification) than the rear in-focus part. 2. An "infinitely long telephoto lens" configured to shoot the same field width. This image has orthographic projection, so the front in-focus part of this picture is exactly the same size (equal magnification) as the rear in-focus part. First, here are the two images as a flashing animated gif, so you can see they really are different. Now, each of the images separately, and I'll leave it to you to figure out which is which. They're either reversed or not. Finally, I'll show a partial stack that does not focus the rear portion of the subject. To my eye, it's clear that perspective is a pretty weak depth cue in this case. Fact is, I simply can't tell which perspective is which, without some concerted study to figure out what lines up with what. Focus, on the other hand, is pretty strong. Ugly, in this case, but strong. I'd be interested to hear what other people see. The "infinitely long telephoto lens" is of course a telecentric system with a finite focal length. Fact is, it's the same Olympus 38 mm bellows lens, with a custom aperture added to provide the telecentricity. The closeup-perspective image is stacked with scale adjustment turned on, while the telephoto-perspective image is stacked with scale adjustment turned off. Zerene Stacker PMax in both cases, no retouching. Real telephoto lenses would have perspectives between these two cases, tending toward the telecentric case as the focal length gets bigger and you back off to correspondingly larger distances. it's the same Olympus 38 mm bellows lens, with a custom aperture added to provide the telecentricity. Rik, I like the way you casually drop that into the discussion. Have you mentioned this elsewhere? Can't recall whether I've mentioned it specifically for the Olympus 38 mm. But it's just another implementation of the general technique illustrated HERE, third image, for the Olympus 80 mm. Stick a limiting aperture at the rear focal point of any lens, and suddenly it becomes telecentric. A ray-traced diagram is shown HERE in the thread on Stopping down a lens combo. There's a bit more discussion in this paper, around pages 14-15. For the 38 mm, the required placement is actually inside the lens barrel, but fortunately still in back of all the lens elements. All I really had to do was cut a disk of black paper with appropriate outside diameter, and put a hole in it to serve as aperture. It's not as good as a commercial telecentric lens, of course, but the paper disk is quite a lot cheaper. Another method for assembling telecentric optics is shown HERE. That method is considerably more practical at low magnification with longer lenses. But since the discussion about Brian's fuchsia involved an MP-E 65, I thought it would be best to illustrate at higher magnification with a shorter lens. Besides, I already had the aperture disk lying around from earlier experiments. By the way, the Stopping down a lens combo thread also contains information that's relevant to this discussion about perspective. Firstly, the illustration HERE, second panel, left side, shows that at 4X magnification an ordinary 50 mm lens just doesn't give much perspective effect -- the grid does converge toward the rear, but only slightly. Secondly, the same panel, right side, shows that when used in the obvious way (rear stopped), the lens combo has quite bizarre perspective -- fairly strong and inverted, so background is bigger. This behavior is typical of high mag lens combos, but nobody mentions it. At least I've never seen an article or even a forum posting that says "Stay away from lens combos because the perspective is weird!" With typical subjects, it seems that nobody even notices, and if they do notice, it's not worth commenting about. If perspective were very important, there'd be lots of comments. In another thread, ChrisR raised some questions about the images shown here. Rather than clutter up that other thread with answers, I though it would be better to put them here. I don't understand how the perspective shift in Rik's exercise could be missed, it's pretty obvious to me, considering the flatness of the subject. Of course it doesn't show well in a small pic, try filling your screen with the changing image (=400% perhaps) With one image you're much more "on top" of it than the other. It's a bit sad, if it doesn't do that for you! Agreed, it's very obvious with the flashing pic. I made the flashing pic specifically because it does make the difference obvious, even to my perspective-challenged eyes. That's because without the flashing -- seeing the two perspectives just side by side or even worse one at a time -- it's hard for me to tell that there even is a difference, let alone what it is. The point of the two larger still pictures was to let other people see them that way too. Do you get a strong effect even from one image alone? If so, then I am happy for you. It IS a flat subject, presumably chosen to be so. I wonder why it wasn't angled more.???? There may be some confusion here. Let me be more explicit about the setup. 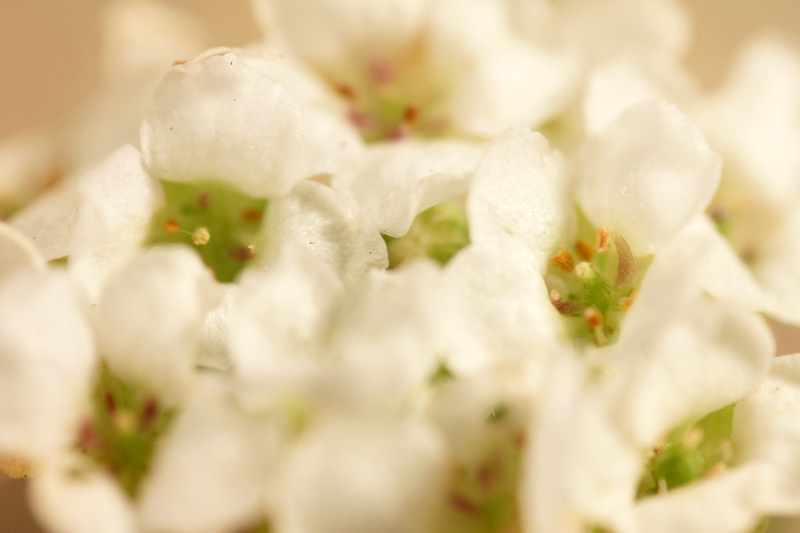 What you're looking at is the very top of a flower head, tipped 45 degrees away from the lens. To make the geometry more obvious, I'll show you a side view, a rocking animation, and one frame from the stack. By the numbers, the field of view is 9.7 mm wide and 6.5 mm high. The depth between front and rear flower parts is also 6.5 mm, depth = frame height. The whole structure is angled back 45 degrees. Given this situation, I don't know quite what to make of your comments. One possibility is that you would want me to angle it back even farther. Another possibility is that despite depth = height and 45 degrees, the image simply looks flat, and you were commenting on what you thought the geometry was. Probably there are others. The discussion was about this fuchsia, not "extreme macro", or flat subjects. Yes, of course. So I considered that Brian's fuchsia was shot with an MP-E 65, which provides magnifications in the range of 1-5X using 65 mm focal length. The results I'm showing here are at 2.3X using a 38 mm focal length. That's in the middle of the MP-E's range, and using an even shorter lens which should exhibit more perspective effect. I chose depth = height, which I guessed was representative of his fuchsia. No doubt I could have gotten a closer match if I knew more about the fuchsia shots, but from what I know right now the results shown here don't strike me as obviously out of line. I haven't had time to experiment with the perspective changes which stacking alters, or not. As I said, I was going to ask Rik about that! If you turn on scale adjustment, then stacking does not alter the perspective. If you turn off scale adjustment, then you impose orthographic projection, which may or may not give radial smearing or echos depending on the amount of scale change within the in-focus slab. See the second and third threads of my telecentric lens series for some further discussion and illustrations. I thought it would be something like that. I first came across supplementary aperture rings about 40 years ago (ouch!) with a dual purpose Jupiter 8 monocular I bought in the days when I had a Kowa E SLR with a fixed lens (diaphragm shutter). There were three discs to use when the monocular was screwed to the front of the prime lens. Even by my standards in those days, the results were poor. Whilst you can see some differences in the animation, the images viewed singly seem to have very few depth clues to me and certainly nothing useful for my brain at least from the perspective. My own experience with macrographs in general is that you tend to get more depth information from shadows and OOF areas. One obvious example is the use of ring macro flashes which without twin bulb ratioing can often give very evenly lit but flat looking results. The same thing can happen with complete subject focus stacks where the result can look very 2-D because of the lack of OOF areas. Thanks for the explanation of what you did. it's hard for me to tell that there even is a difference, let alone what it is.
? Even if you make them both full screen width? 9mm field width? er - seems too small for the fuchsias I'm vaguely familiar with - though there is a huge variation. Ummm 2.5 to 1, 38mm lens, object distance 38+38/2.5= 53mm. So , with a fov equivalent to a 212mm lens on 35mm, it should look pretty flat? I must say I was surprised to see that in fact it's angled at 45º, it does look flatter. 36/20 x130 = 234mm (on 35mm) which is even longer. Well that seems to scotch that! And that would really look flat..
- texture, or repeated similar objects at different distances and so on, which repeat through the image. So, I need to find something similarly sized to photo, with more "clues". Just for info my fuchsia shots were around 2.5 :1 FF. The fuchsia was a popped fuchsia bud where the flower petals have not expanded. I looked for the smallest unpopped bud which had some petals inside. Huge variety of forms in fuchsias though. Specialists' collections are anazing. sorry the FF is short for full frame- 36mm. A lot narrower than I expected. I'm glad to hear surprise at finding out how far back the flower was tilted. I did not intend to withhold the geometry -- it was just very late at night (2:26 am) and I was too tired to do more. But in retrospect, withholding the geometry was the perfect thing to have done because it caused people to react to what's actually in the images instead of having their interpretation colored by prior knowledge. The images look flat to me too. I used to be surprised by that, but finally I came to grips with how perspective cues actually work and realized that this sort of image essentially doesn't have any. Many other macro images don't either, for all the reasons that Chris talks about, and maybe a couple more besides. Perspective cues rely on scale differences between foreground and background. The angle of view gets involved, but fundamentally what matters most is the ratio between depth of field and distance to subject. When you shoot a flower in a garden with normal, wideangle, and telephoto lenses, it's easy to tell the difference between those shots by comparing the size of foreground and background flowers. If two similar flowers are 1 foot different in depth, and you're standing 2 feet away from the closer one, then the size ratios are 3:2. Stick on a wideangle, move in to 1 foot, and the size ratio increases to 2:1. Switch to a telephoto, back off to 10 feet, and the ratio drops to 1.10:1. A ratio of 2:1 is compelling and 3:2 is pretty obvious. But 1.10:1 is a lot harder to see, so the shot from 10 feet looks flat. Shoot it from 100 feet through a telescope and it will look a little flatter, but that size ratio between foreground and background flowers never goes below 1.00:1 no matter how far back you move. With gardens, streets, and portraits, many setups have big ratios of depth to distance so perspective is a strong cue. With studio macro, it's more common to have small ratios so perspective gets a lot weaker. In the case I illustrated, the distance from entrance pupil to focus point is around 60 mm. Since the depth of subject is about 6.5 mm, the size ratio is only about 1.11:1 even for features at the very front and back of the in-focus range. For features not at the very front and very back, it's even less. Brian's setup is larger than mine, but the ratios are similar. Hence my comment in his thread, "so I'll bet that very similar images could have been shot even with a much longer lens". Yes, switching to a longer lens would have diminished the perspective cues even farther. But given how weak those cues already were, I think the difference would not have been large. But very typical of macro. This is another case where relying on experience in other regimes leads to the wrong intuition. In that respect it's similar to some other issues we've discussed, like the effects of sensor size and apertures in macro versus landscape photography. Even if you make them both full screen width? Yes. I can say this quite confidently because I did my stacking at full screen 1680x1050, and I had to be very careful to crosscheck the source frame numbers against my notes because the overall appearance was so similar. Again, I emphasize that the differences are easy to see in the animation that flashes directly between them. That display technique taps into the piece of our visual system that evolved to give us early warning of jumping tigers and falling trees. It's a movement detector and it's finely honed. The differences are "obvious". But when images are viewed side by side, or one at a time, differences have to get detected by other parts of the visual system that are far less effective. There is a phenomenon called "change blindness", with a horde of experiments demonstrating that people very often do not notice differences between two images unless they see the change happen, even when the differences are blatantly obvious once they are noticed. Google search on change blindness demos and you'll find some great demos using images that are identical except for isolated differences. The perspective images here are a little different from the typical change blindness demos in that the perspective differences come as slight changes in scale spread across the whole image, but the concept is very similar. When I see the two images separately, the task I'm faced with is essentially to evaluate each image on its own, label it according to what I think the perspective is, and then compare the labels. Problem is, the differences in the perspective are too small for me to evaluate reliably, hence I'm stuck not being able to tell whether there even is a difference. Show them to me side by side and I can puzzle it out, but that's a matter of cognition, not perception. A fascinating digression from the question - of what depth is perceived in a single image - to how small changes made between different images are easily missed. Back at the flower stills, we obviously see the two images differently, or differently interpret the meaning of "very similar". I remember my wife asking why I'd discarded a dozen 20x16 colour prints before achieving what I wanted, for exhibition. To her they all looked the same. The change in perspective is as I said less than I thought it would be, before I had worked out why, from the fov angles. This is another case where relying on experience in other regimes leads to the wrong intuition. Mathematical factors have a partial impact on the outcome here. I didn't understand the extent. The outcome is qualitatively the same though, so perhaps "wrong" is a bit strong. I don't think I've used my macro lenses in "other regimes"! I don't think using FOV in the description of perspective is correct. When images are stitched or cropped the FOV no longer matches the normal FOV for the focal length. The perspective of an image will not change when it is taken with different focal length lens. At macro distances it may not be possible to take the image from the same position because of limitations in the focus distances between lens. I don't think using FOV in the description of perspective is correct. When images are stitched or cropped the FOV no longer matches the normal FOV for the focal length. 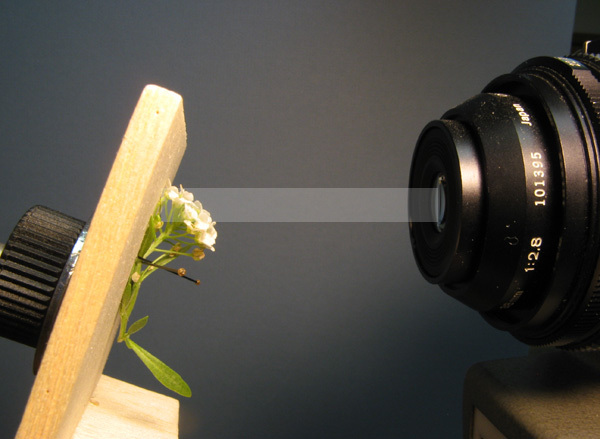 The perspective of an image will not change when it is taken with different focal length lens. I'm "with you" there, ie, I understand and agree. Conventionally it's only the positon of the camera which matters, That's fine for crops, but if you start stitching a lot of "views" together, to get a wider angle, the appearance (loosely referred to as perspective) depends how you map them on to a 2D picture. Rik territory! Up to to some angle , the projection wouldn't matter too much, then things start to look "distorted" - as with non-macro panoramas.? "Incorrect" perspective ( when the finished picture is viewed) goes from flat and boring via dynamic and involving, to whacky and distorted.